What do I put in an order of service? Your orders of service can be as brief or detailed as you want to make them – you don’t even have to have them if you trying to keep costs down or want to save on paper. The key thing to remember when deciding what to put in is that if you’re having an order of service booklet, you’ll have either four or eight pages to work with, due to the way they’re folded. Obviously, the more pages you have, the more you’ll end up spending on design and printing, so what needs to go in? – Words to anything you want your guests to sing along to. Be it a hymn or a song, even if it’s well known guests will need the lyrics to nudge them along. – Details of the wedding party. It’s handy for guests to know who’s who, and you can also list the people doing your readings. – Any instructions guests need to follow, such as not throwing confetti outside, or not taking photos during the ceremony. – Any special thank yous, or mentions of guests unable to be with you (we had a line on our wedding party page referencing both our late fathers, which was a lovely way to acknowledge how much they were missed without making it the focus of the ceremony). – Anything you want to remember about the ceremony in years to come. 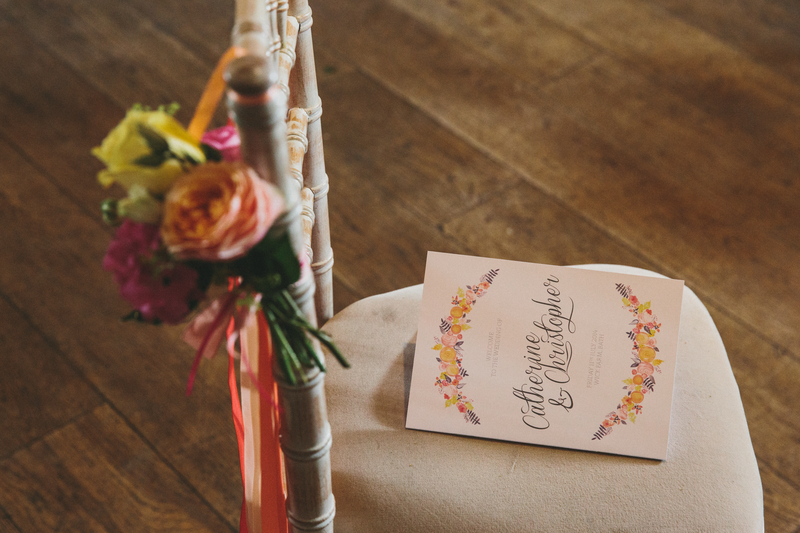 That could be the music that you walked down the aisle to, the songs that were played while you signed the register or the readings you had – having them written down will bring back lovely memories every time you look at the order of service. When we got married, we opted for an A5 booklet with eight pages, which we had printed locally and stapled together (you can expect to pay more if each one is wrapped with ribbon as well). We ordered around 75 for 100 guests, on the basis that people could share, plus we wanted some to keep as mementos. We used card for the covers with a paper inside, choosing a cover that was very similar to the invites we sent out to tie our wedding look together. As we had a civil service, we didn’t need to worry about words to hymns or prayers – the only lyrics we included were those of the song we had as a singalong after our vows. We left the inside cover blank, then opened with a page listing our wedding party. On page three we had the song lyrics, then page four was a condensed order of service. We listed the bride’s entrance, along with the piece of music being played (good old Canon in D by Pachelbel! ), then to save space we added just the name of the reading, who was reading it, and two lines of the poems that we particularly loved rather than reproducing them in full. We also included a line from our personalised vows under the exchange of rings heading, and then ended by telling guests when to throw their confetti as we weren’t allowed to throw it outside. The final page was a little message to our family and friends to thank them for celebrating with us, signed by us as Mr & Mrs! I’ll post some photos soon, but in the meantime, tell us about your orders of service! « When do you send out wedding invitations? 1Pingbacks & Trackbacks on What do I put in an order of service?